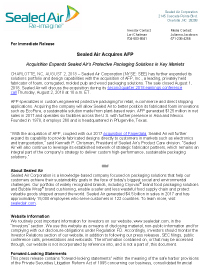 August 2, 2018 – Sealed Air Corporation (NYSE: SEE) has further expanded its solutions portfolio and design capabilities with the acquisition of AFP, Inc., a leading, privately held fabricator of foam, corrugated, molded pulp and wood packaging solutions. February 24, 2017 AFP, Inc. acquired Springfield, MO's Engineered Packaging, Inc.'s (EPI) protective packaging division... please click on the image above for more information about our growth. 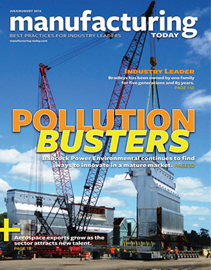 AFP, Inc. was featured in the July/August 2016 issue of Manufacturing Today. The write up is a great summation of AFP's founding and history, growth goals, environmental initiatives, and material neutral packaging design and manufacture. CHARLOTTE, NC, AUGUST 2, 2018 - Sealed Air Corporation (NYSE: SEE) has further expanded its solutions portfolio and design capabilities with the acquisition of AFP, Inc., a leading, privately held fabricator of foam, corrugated, molded pulp and wood packaging solutions. The sale closed August 1, 2018. Sealed Air will discuss the acquisition during its second quarter 2018 earnings conference call Thursday, August 2, 2018 at 10 a.m. ET. "With the acquisition of AFP, coupled with our 2017 acquisition of Fagerdala, Sealed Air will further expand its capability to provide fabricated designs directly to customers in markets such as electronics and transportation," said Kenneth P. Chrisman, President of Sealed Air's Product Care division. "Sealed Air will also continue to leverage its established network of strategic fabricator partners, which remains an integral part of the company's strategy to deliver custom high-performance, sustainable packaging solutions." This press release contains "forward-looking statements" within the meaning of the safe harbor provisions of the Private Securities Litigation Reform Act of 1995 concerning our business, consolidated financial condition and results of operations. Forward-looking statements are subject to risks and uncertainties, many of which are outside our control, which could cause actual results to differ materially from these statements. Therefore, you should not rely on any of these forward-looking statements. Forward-looking statements can be identified by such words as "anticipates," "believes," "plan," "assumes," "could," "should," "estimates," "expects," "intends," "potential," "seek," "predict," "may," "will" and similar references to future periods. All statements other than statements of historical facts included in this press release regarding our strategies, prospects, financial condition, operations, costs, plans and objectives are forward-looking statements. Examples of forward-looking statements include, among others, statements we make regarding expected future operating results, expectations regarding the results of restructuring and other programs, anticipated levels of capital expenditures and expectations of the effect on our financial condition of claims, litigation, environmental costs, contingent liabilities and governmental and regulatory investigations and proceedings. The following are important factors that we believe could cause actual results to differ materially from those in our forward-looking statements: global economic and political conditions, currency translation and devaluation effects, changes in raw material pricing and availability, competitive conditions, the success of new product offerings, consumer preferences, the effects of animal and food-related health issues, pandemics, changes in energy costs, environmental matters, the success of our restructuring activities, the success of our financial growth, profitability, cash generation and manufacturing strategies and our cost reduction and productivity efforts, changes in our credit ratings, the tax benefit associated with the Settlement agreement (as defined in our 2017 Annual Report on Form 10-K), regulatory actions and legal matters, and the other information referenced in the "Risk Factors" section appearing in our most recent Annual Report on Form 10-K, as filed with the Securities and Exchange Commission, and as revised and updated by our Quarterly Reports on Form 10-Q and Current Reports on Form 8-K. Any forward-looking statement made by us is based only on information currently available to us and speaks only as of the date on which it is made. We undertake no obligation to publicly update any forward-looking statement, whether written or oral, that may be made from time to time, whether as a result of new information, future developments or otherwise. February 24, 2017 AFP, Inc. announces its acquisition of Springfield, MO's EPI protective packaging division. February 24, 2017 AFP, Inc acquired Springfield, MO's Engineered Packaging, Inc.'s (EPI) protective packaging division. Over a 26 year period EPI, which is owned and lead by Mr. Jim Stout, successfully built a strong business in the custom engineered packaging space by creating a customer-centric culture. AFP will continue to stay aligned with Mr. Stout has he begins to explore his retirement. As a result of the acquisition, AFP strengthens its ability to serve existing customers in the Midwest and is strategically positioned for growth. Greg Peden Senior VP Emerging Business Development says, "AFP recognized strong relationships with customers and vendors, overlaps in core competencies, integration of technologies, and expansion of converting capabilities, in a new geography we were not currently serving." EPI will continue to operate their Temperature Controlled Packaging Division and AFP will assume the protective packaging, distribution and returnable/consumable lines of business. AFP looks forward to serving product manufacturer's packaging needs and growing customer relationships in the greater Midwest.